The CH07 Lounge Chair, commonly known as the Shell Chair, is perhaps one of the most intriguing furniture designs of the 20th century. Its appeal is definitively not trivial, which is probably the reason why the CH07 chair was not an instant, commercial success story. It took almost 35 years for people to fully appreciate the unconventional form of this extraordinary chair. The design of the Shell Chair was conceived by Hans J. Wegner – a legendary figure in Danish Modernism and a famous furniture designer, who had a great passion for chairs; thus his nickname “the Master of the Chair”. Wegner is responsible for more than 500 projects of chairs, a lot of which were later mass-produced. 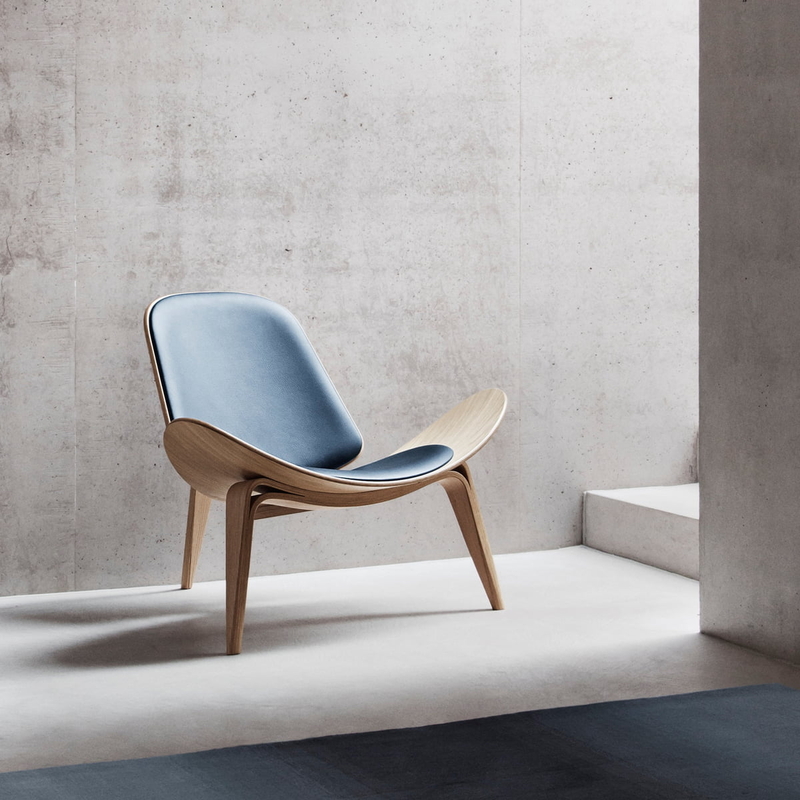 Although the first Shell Chair was introduced in 1963, its history dates back to 1948, when Wegner started experimenting with a relatively new (back then) process of forming laminated wood. One year later, he introduced a prototype manufactured from the bent plywood, which was supported on an unusual three-leg base. In 1963, he revived the three-legged chair design by creating the Shell Chair, which had its official debut at a Danish furniture exhibition. Despite the fact that the chair was well received by critics, its avant-garde, futuristic shape made the general public rather reluctant. Due to that, its mass production was restrained, leaving only a small initial batch available for sale. The Shell Chair was brought back to life by the Carl Hansen & Son furniture company, which launched the CH07 again into production in 1997. The Shell Chair, produced under the new brand, instantly enjoyed a commercial breakthrough. It has also received numerous design awards. The form of the chair is rather ascetic, yet sophisticated and unusual. Its design embodies its creator’s famous credo, which claims that: “A chair should have no rear view. It should be beautiful from all sides and angles." Indeed, the chair with its famous curves looks very appealing and futuristic under any angle. The curvy, organic shape of the CH07 was achieved through the utilization of the bent plywood, processing of which was pioneered by Charles Eames. Therefore the resemblance between the Shell Chair and the famous LCW Chair is undeniable. The bent plywood used for production consists of several layers of oak or walnut veneer, which are then press molded into the desired shape. A sit pan of the chair, with its wing-like parabolic shape, is a very distinctive feature of the design, which gives the chair its famous smiley appearance. The three-leg base is yet another remarkable component of the chair. Its front legs are made of one piece of continuous veneer laminate, tapered at both ends. The back leg, which also serves as a support for the backrest, is made in a similar way. The curves of the front legs are extended sideways, adjacently to the curvature of the bent sit pan. This solution attributes to the chair’s soft, ductile look. An extremely low center of gravity makes the chair very stable, despite being supported on just three legs. The backrest of the CH07 is leant slightly backwards, hinting at its comfortable, relaxing feel. The seat and backrest are available upholstered in a wide variety of fabrics and leathers. Although the chair looks like a masterpiece of modern art, it is fully functional and surprisingly comfortable. While designing the Shell Chair, Wegner tested several different legs configurations using 1:5 scale models. Eventually, the three-legged solution of choice was adopted from his 1949 prototype. The Maharam Project Shell Chair and The Jubilee Shell Chair. The Maharam Project Shell Chair was upholstered using a wide variety of fabrics provided by the Maharam textiles company. The Jubilee Shell Chair had the seat and back made of oil-treated teak and the frame made of oil-treated oak; the same way it was manufactured in the early 1963 models. The chair was upholstered using rare and expensive red Niger goat hide, which has a very dense structure resulting in extremely strong and durable leather quality.